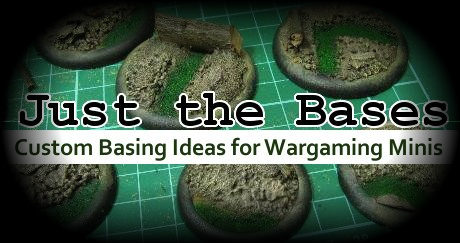 Dedicated to the art of creating custom bases for wargaming miniatures. Time to add some tree trunks to the whole shebang. These are the same twigs used in the previous tutorial. Actually these bases are made for the same army, so they should remain visually compatible. Once all the glue is dry (and i mean completely wait for 10 hours at least dry) the bases can be primed. This time around I'm going with black gesso instead of just drowning the base in brown paint, since I have the milliput to think about, and I don't want to destroy all the nice patterning on it with tons of paint. Welcome! Just the Bases Has Launched.